What is Trace Minerals Concentrate? Trace minerals are chromium, copper, fluoride, iodine, iron, manganese, molybdenum, selenium, zinc and more… They are considered trace minerals because your body needs them in smaller amounts—fewer than 20 mg a day. Minerals in a colloidal form have proven themselves to assist in tissue healing and general health. 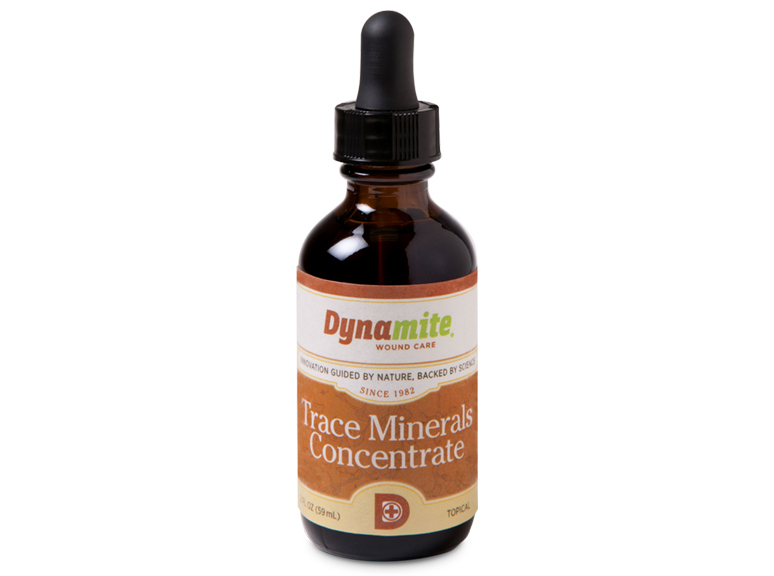 Dynamite’s product, Trace Minerals Concentrate (TMC), is a concentrated solution of minerals and trace minerals in liquid form. How can I use Trace Minerals Concentrate (TMC)? Known for its amazing blood-stopping properties, this unique healing agent contains the full spectrum of trace minerals in a highly concentrated form. Trace Minerals Concentrate can be used topically to help stop bleeding from cuts and scrapes and start the healing process. • Apply full strength on sores; this may require a few applications. • Give one drop in dog ears (if dog shakes its head and paws at his ears) daily or weekly depending on need. • Apply immediately to mosquito bites, etc. to stop itching. We have so many wonderful testimonials on the power of Trace Minerals Concentrate (TMC). 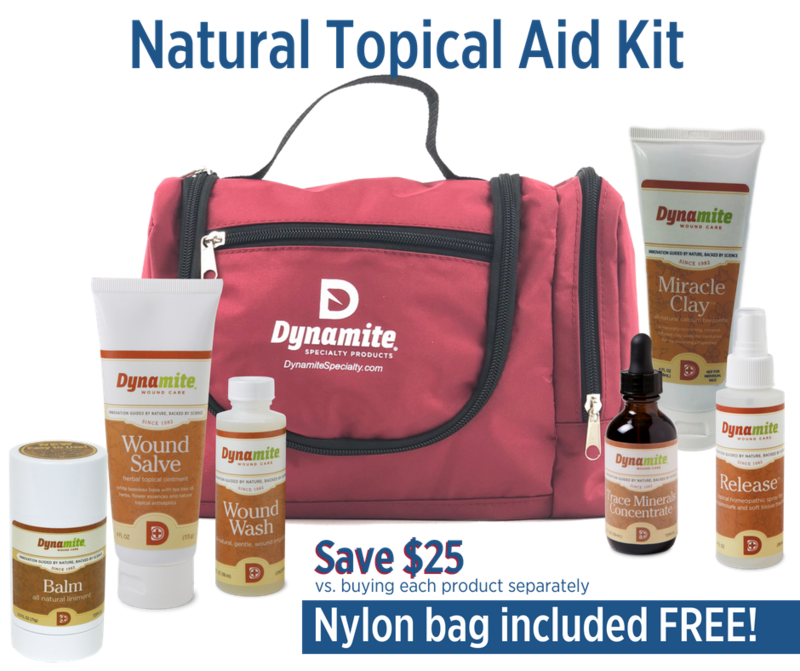 This amazing product, found in the Dynamite wound care line, has countless uses and can be used on any species of animal as well as on you and your family! This is the perfect product to keep in your bathroom cabinet, in your car emergency kit, in your barn, in your grooming kit and at work. This is what Trace Minerals Concentrate is known for—its amazing blood stopping power. Simply drop TMC on any cut or wound that is bleeding and it will coagulate in seconds. You will be amazed! TMC is excellent to have on hand if you are trimming your dog’s nails and get too close to the quick. Your first line of defense if you experience any kind of cut should be TMC. It also provides a healthy dose of trace minerals right at the wound that will support healing. Testimonials sent in over the years have touted that wounds treated with TMC heal much faster. The ingredients in Trace Minerals Concentrate are designed to support the body’s natural healing process. Trace Minerals Concentrate comes in 4 ounce bottles with a convenient dropper lid to dispense the product right where you need it. Click here to buy. Also available in the Topical Aid Kit! My old Beagle and Golden pup had it out over a carrot [this morning] and although it was the pup that backed down, poor Bill came out with a hole clear through his left ear! It looked bad as he kept shaking his head and had blood everywhere, but once we got it cleaned up it was just a matter of getting the bleeding to stop. I’ve gone through the futile routine of trying to bandage a dogs ear so I was thrilled to have the Trace Minerals Concentrate to try. The bleeding stopped in under a minute (no yelp or whimper from Bill when applied) and when I left for work a half hour later there was a nice scab and he seemed calm. As I drove to work I thought about the fact that I’d probably still be home (and in trouble for being late to work) trying to get the bleeding to stop in my “pre” Dynamite days. In just the last week Trace Minerals Concentrate got my cat through an upper respiratory infection, helped my pup’s neuter incision heal, stopped the bleeding on my husband’s finger after a drill accident and now this! I think I will order bottles for my purse, glove box, barn, saddle bags…the medicine cabinet is not enough. Everyone should have TMC—it’s worth its weight in gold! For more great testimonials on Trace Minerals Concentrate, check out our wound care line products page.